I am always trying to come up with a couples costume where the man is a big bald guy to accommodate my hubby, fortunately, there are plenty to choose from. 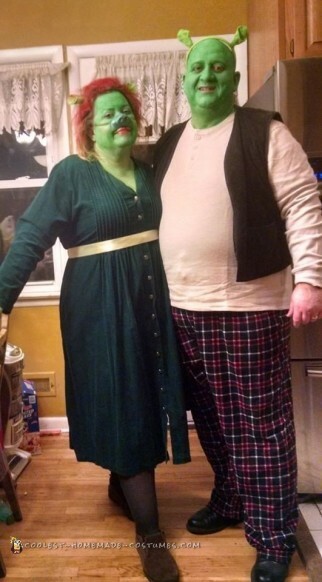 This year, we went with the Fiona and Shrek costumes. For Fiona, I found the perfect green dress at Unique (a chain of thrift stores) and threw a ribbon around it. I sprayed my hair red and used store bought ears and a snout to complete the look. For Shrek, I bought plaid Pajama bottoms and a cream shirt at Walmart and added a vest that was laying around the house. He wore the same ears (but not the snout) and we both painted ourselves green all over. We were a big hit!